Dive into the underwater fun of Tropical Fish Shop - Annabel's Adventure, and enjoy the wonders of marine life! Annabel just had a relaxing vacation but is nowhere near ready to pack up her sandals and head back to pushing papers in an office. Instead, she's decided to stick around and land her dream job. With a little ingenuity, she's convinced the local tropical fish shop to stay open despite bad business, and allow her to dive for profits! Take to the ocean with Annabel and bring back colorful sea creatures to keep the shop afloat. 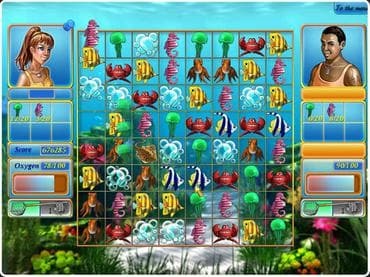 With your objective list in hand, match three or more of the same to collect fish, crabs, seahorses and more. Watch your dive time however, because you only have a limited amount of oxygen to complete the catch. Challenge 55 levels, participate in diving contests and earn trophies. If you have questions about Tropical Fish Shop: Annabel’s Adventure game, please contact us using this form.